Statement from the Minister for Transport backs future research into scooters and motorcycle use. It was refreshing to read in the media this week a statement from the Transport Minister. Mr Albanese suggested that two wheeled vehicles like scooters and motorcycles can form part of the solution when it comes to our overcrowded road networks. What this all means for motorcycles and scooters is anyone's guess. These are all nice broad statements below and with an election looming this could well be an attempt to grab votes from a particular cross section of the community. Yes, cynical I know. Whilst there has been a change in the types of motorcycles purchased, the industry to a large degree is not growing. There needs to be further incentive to get people out of cars and thinking two wheels. Things like tax breaks and a reduction in registration and insurance costs would be a good first step. As they say, any press is good press. As riders we already clearly see and know the benefits of riding, educating the broader community is the bigger challenge. Below were the statements made by Mr Albanese as reported this week by News.com.au. "Scooters and commuter bikes now dominate sales growth. Twenty years ago, dealers in Australia were lucky to move 700 scooters in a year - these days they sell a 1000 a month," the minister said today. "And lightweight commuter bikes are usually the bestsellers among motorcycles." Mr Albanese pledged to maximise those benefits from motorbikes and to make two-wheeled travel easier for more people to take up. Already some 700,000 Australians have licences for motorcycles. "The other unarguable fact is that motorcycles and scooters are the most fuel-efficient motorised personal transport mode," Mr Albanese told a group of riders including MPs and members of the Australian Motorcycle Council. "They have less embodied energy, only about a fifth of that involved in producing the rubber and steel and various parts that make up a car. Compared to the car, they also cause much less damage to roads - not to mention lower emissions. "The surge in demand for cycles and scooters has created a major challenge." Work with states for nationally uniform regulations such as those dealing with safety standards for helmets. Mr Albanese said there already was evidence that powered two-wheeled travel was helping make cities better places in which to live. "They are space efficient at a time when space is at a premium in our major cities. Every day we see five or more scooters parked in a single car space," Mr Albanese said. He said: "Space-efficient transport modes like motorbikes and scooters can help more people reach their city centres helping entire cities function better. "Motorcycles and scooters can fill the crucial gap in cities between walking and cycling, and taking the car. Too far for the push bike? Wheel out the Vespa, hit the starter button and you're halfway there." It's on again, this year in Hasselt, Belgium. A total of 2300 Vespa's converge on the small Flemish village. 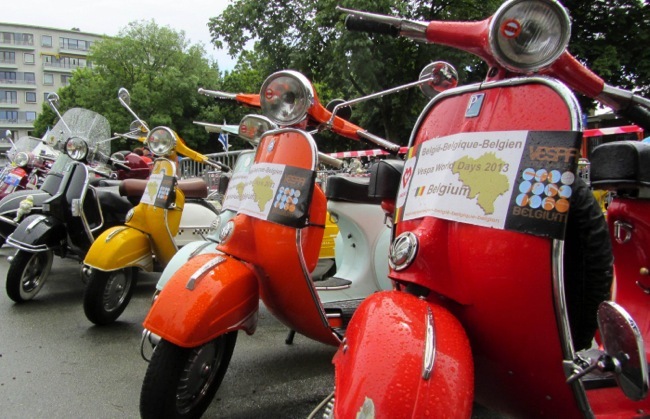 Belgium is the country hosting this years Vespa World Days. 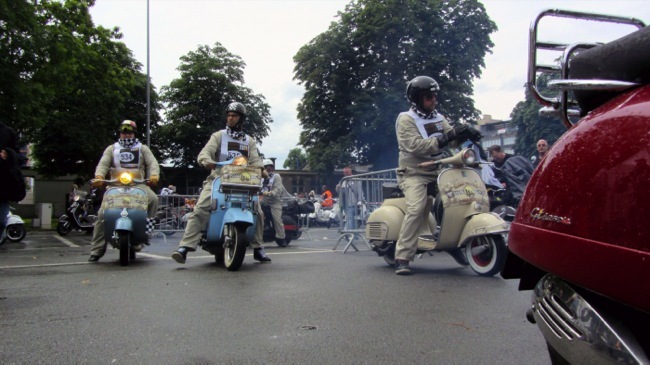 Thousands of Vespa's arrive from all over the world with 74 years separating the oldest and youngest participant. 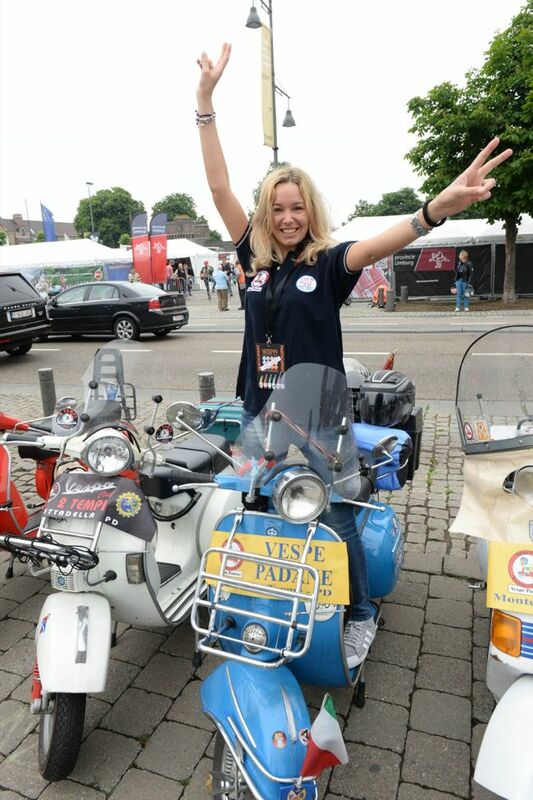 Hasselt, 21 June 2013 - Vespa's and Vespa riders from 21 countries invaded Hasselt, a Flemish village in Belgium, for the 2013 Vespa World Days. 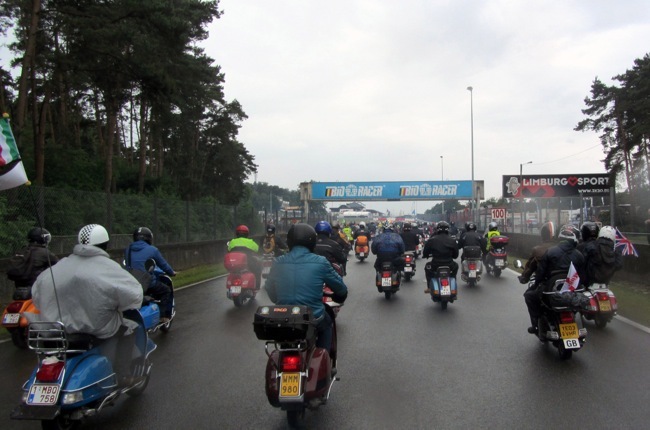 World Days is a large international rally that summons and joins together Vespa Clubs from all over the world. The first Vespa Clubs were established in Italy, but they immediately spread abroad. More than six decades of history, made up of passion and friendship which, in 2006 (coinciding with Vespa's 60th anniversary), led to the establishment of the Vespa World Club, which today carries out the coordination and promotion functions for all the Vespa organisations in the world. Suzuki Australia launches the 2013 Suzuki Burgman. The big Burger gets promoted to business class with a shed load of new features. 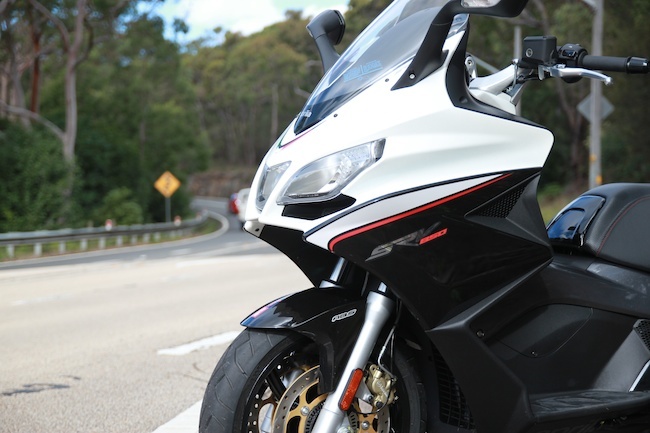 Suzuki Australia is pleased to announce the arrival of its automatic touring cycle masterpiece - the all-new Burgman 650. Overhauled for 2013, the new Burgman 650 features all-new styling, reduced weight and improved fuel economy, while maintaining its user-friendly power. 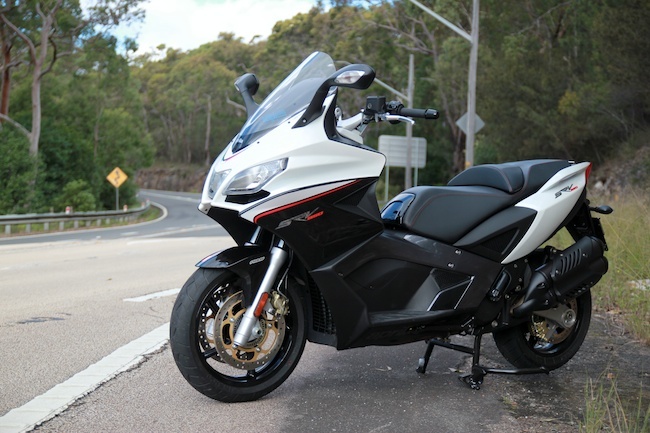 "The new Burgman 650 upgrades the rider to business class with a raft of user friendly technologies designed to ensure maximum comfort and performance", said Suzuki Australia Motorcycles National Marketing Manager Lewis Croft. From every angle, the Burgman 650 displays smart technology and superior quality with sharply styled multi-reflector headlights, dual multi-reflector tail lights and an all-new triangle section muffler ensuring a sleek look and satisfying the most stringent emissions regulations. 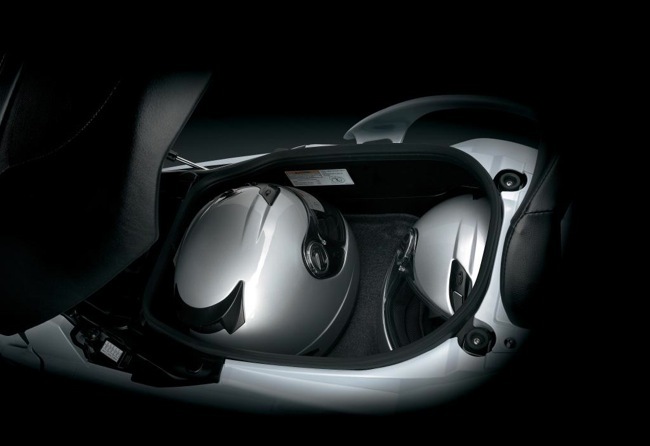 An expansive, thickly padded seat allows plenty of space for two people to sit comfortably for long stretches and includes an easily adjustable rider backrest, while electronically-controlled height adjustable windscreen ensures maximum comfort for all riders. The newly designed, slimmer tail section finishes off the all-new Burgman 650's sharp look. 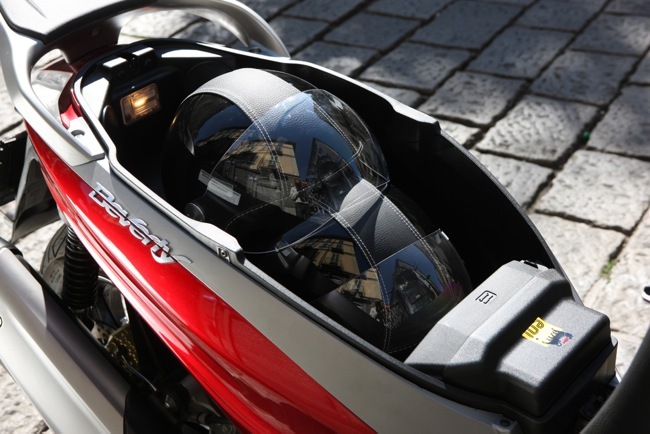 The Burgman 650 boasts a surfeit of storage spaces, including a 50-litre under-seat storage compartment, enough for two standard size full-face helmets, plus three front compartments for smaller items, one containing 12v DC accessory outlet, and an additional cable lock allowing the rider to secure a helmet outside the compartment. 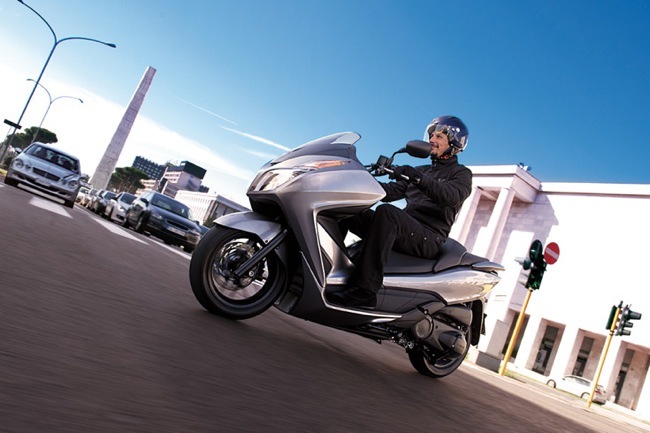 The Burgman 650 is powered by a 638cc, twin-cylinder, computerised fuel-injected powerplant delivering exceptionally smooth performance, while the O2 feedback system with catalyser boosts fuel efficiency and minimises emissions. Reworked transmission settings and reduced mechanical losses contribute to increased fuel economy, with the Burgman's engine using 15 per cent less fuel* than the previous model in drive mode. 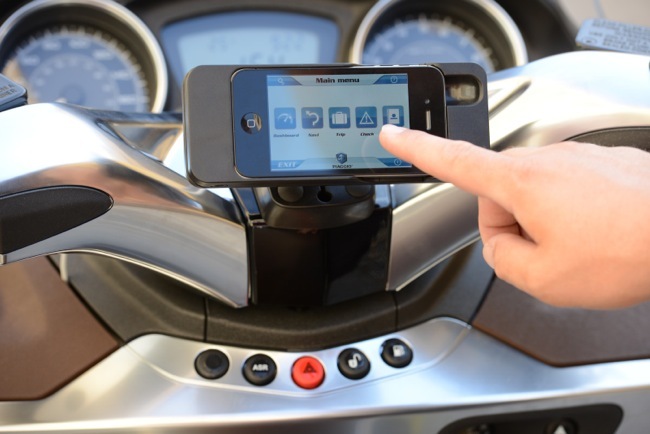 The automatic transmission delivers excellent control and is adjustable by a push of a button on the handlebar, allowing riders to choose between three different modes - two fully automatic (Drive and Power) and Manual. The Drive mode increases efficiency at normal road speeds and provides smooth, linear, power delivery for easy riding, the Power mode delivers more punch for spirited riders and the Manual mode allows the rider complete control via six pre-set gear ratios. The updated easy-to-read instrument panel keeps the rider fully informed and features the all-new Eco Drive Indicator to encourage optimum fuel efficiency, with a light appearing when the Burgman 650 is operated in a fuel-efficient manner^. The Antilock Braking System (ABS) helps maximise control by preventing the wheels from locking during excessive braking and it weighs an impressive 55 per cent less than the system on its predecessor. 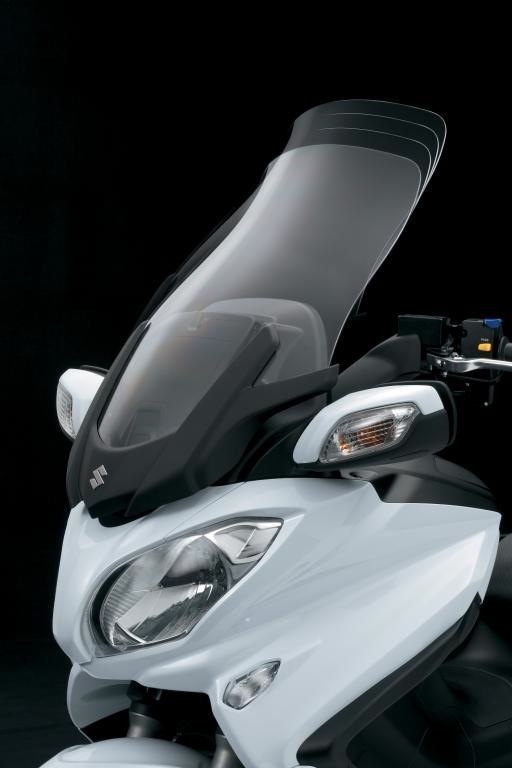 For increased security, the Burgman 650 is equipped with a Suzuki Advanced Immobiliser System (SAIS), and also a magnetic cover over the ignition switch which only opens with the correctly coded key. 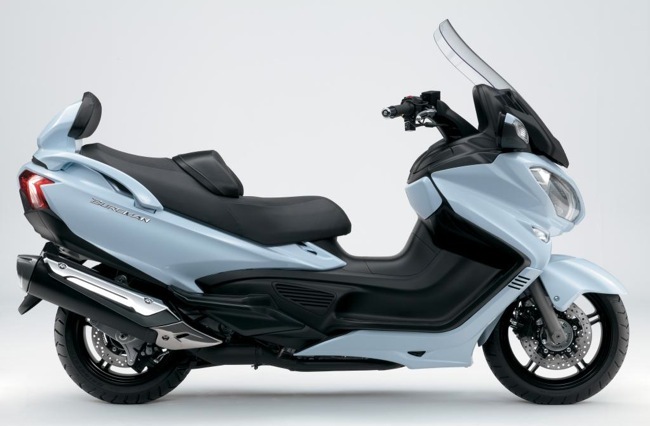 The Burgman 650 is the king of comfort, it boasts a truly luxurious ride with easy to read and operate controls, fantastic wind protection and with exceptional smooth performance to match. Wether it's going down to the local shops or touring across the country, you can do it in comfort and style aboard the Burgman. Available exclusively in stylish Pearl White, the 2013 Burgman 650 is on sale now with a recommended retail price of $13,590**. ^The Eco Drive Indicator does not automatically improve fuel economy but may help riders refine their riding efficiently and improve fuel consumption. ** Recommended Price includes GST, excludes dealer delivery and government charges. A little taste of what's to come. Our first encounter with the worlds most powerful production scooter, Aprilia's SRV 850 with ABS and traction control. The long awaited SRV 850 has finally arrived in the country and as the final paperwork gets shuffled we had a chance to get our first small taste. It's funny how looking at a scooter in a series of photos can shape your thoughts. In the SRV's case I was thinking big, high seat height and heavy. Looking at the spec sheet, the SRV weighs in at 250 kg's and jams a 839 cc engine into a double cradle frame. This is a scooter with a claimed top speed of 200 km/h. Seeing the SRV in the flesh for the first time would allow me to form my own impressions. Being the first to ride the SRV would be even better. We'll remove seat height from being an issue, the SRV (even for me), is easy to throw a leg over and the reach to the ground is not as far as one might expect. Next thing you notice is the feeling of weight. For the SRV, it's all surprisingly down low with none of that top heaviness you can experience with other maxi scooters. Whilst pictures make the SRV look rather long, in real life it feels far more compact. The seating position throws your weight over the front wheel and things feel relatively thin when seated. Once rolling, the next thing you notice is how easy the SRV is to ride. Gone is all the complexity of the Mana and the SRV is simply twist and go. The only choice you need to make is traction control "on" or traction control "off". The rest is up to the right hand and this is where things get a tad bit interesting. The SRV is quick, sneaky quick. Initially I was finding it hard to relate to how easily the SRV builds speed. At just 60 km/h it feels like a crawl, at 110 km/h and we're still not raising a sweat. Do be warned, save plenty of points on the licence before carving up your local stretch. Most surprising was the low speed stability factor, so important when commuting. For all of its power and high speed dynamics, the SRV was also easy to ride slow. Doing the odd U-turn or just slowing down and coming to a complete stop, the SRV was easily managed. This is no doubt helped by a low centre of gravity and a more than manageable seat height. The SRV does hide its bulk well and at no time does it give you that tip toe - over she goes - feeling. We had a chance to sample the SRV over a short stretch. The freeway section is where the SRV got to show off its long legs. The SRV will eat up long distance commuting, here the SRV is effortless. The screen isn't so freeway friendly but this could be resolved with something taller. Where the SRV shines is on fast flowing corners, this is where you can get on and off the throttle really early and just concentrate on road position. The chassis feels well up to the task and big wheels at both ends instil confidence. This is one very fast scooter. One glaringly obvious issue is storage (or lack there of) and it's a well known fact. The SRV 850 comes with room for one helmet, and one helmet only. Not even room enough to accept my 15 inch laptop and this means backpack or a box is a necessity. I did notice a 12 volt charger and electronic seat opener. 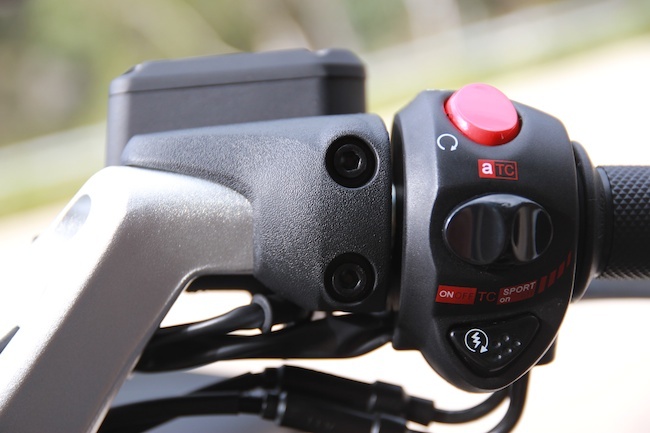 Other features worth mentioning include the Piaggio sourced dash, the quality look and feel around the bar area and the 4 position adjustable levers. The SRV 850 arrives in dealers mid next month. Price has been set at $15,990 plus on road costs. The standard of fit, finish and that European build quality are all immediately apparent. 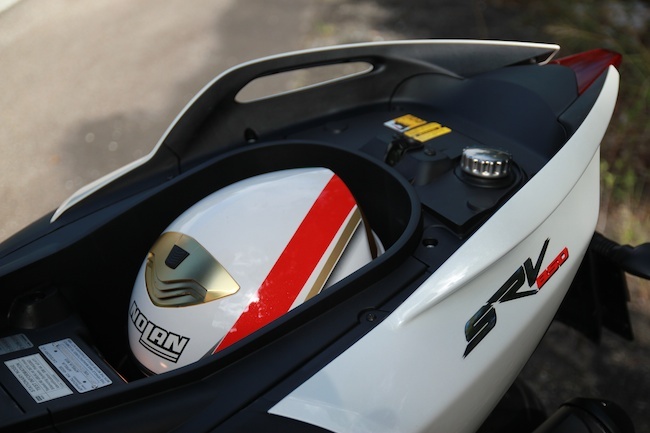 The SRV 850 comes standard with ABS and traction control and borrows its front end nose cone from Aprilia's RSV4 superbike. The rear tail comes courtesy of the Dorsoduro 1200. Our full review will come late July when the SRV 850 returns with Arrow pipe and additional storage courtesy of a colour matched factory top box. 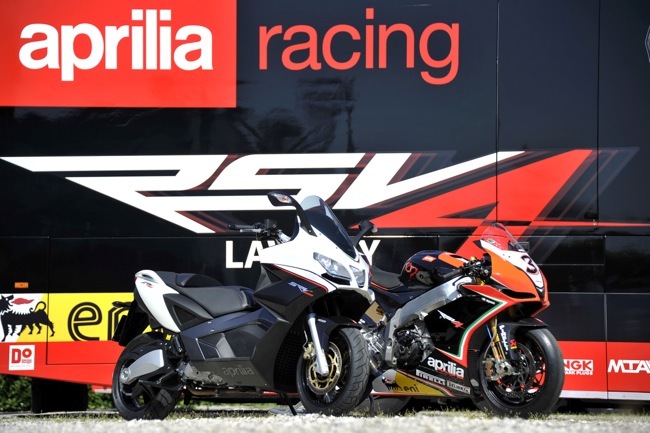 The SRV 850 is replacing the Aprilia Mana in the Australian line-up, and where the Mana was more motorcycle, the SRV is definitely all scooter - the worlds most powerful production scooter at that. Bring on July. 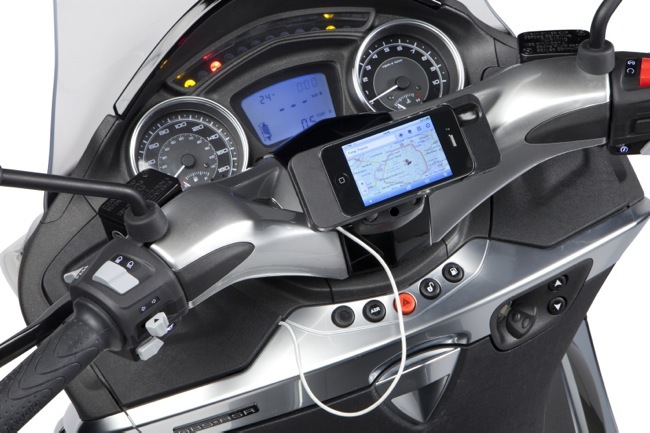 Piaggio Europe upgrades the Mp3 LT range. 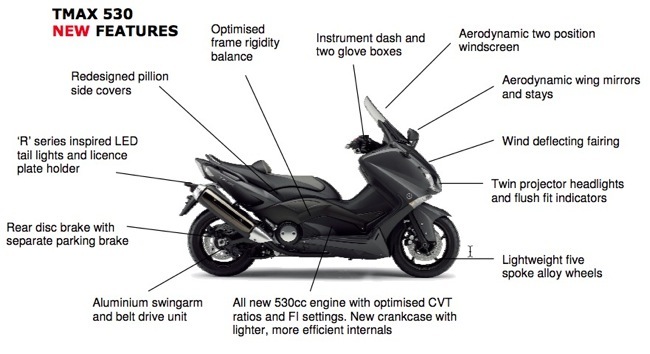 Giving us an insight into future upgrades across the premium Piaggio range. 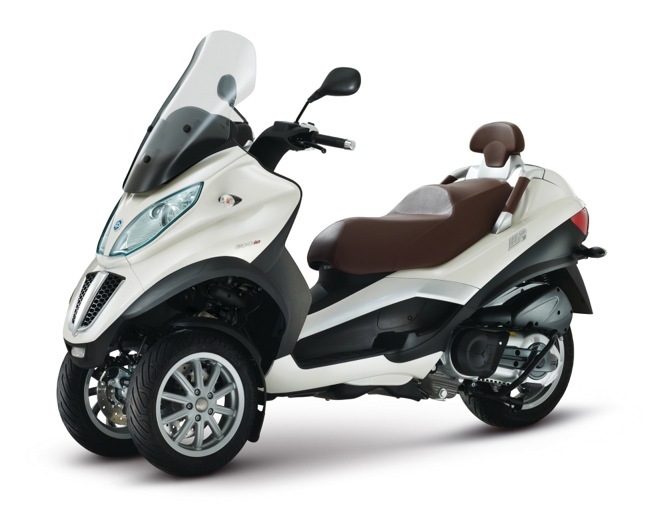 Piaggio have updated the Mp3 LT range recently in Europe. Remembering we no longer have the full sized Mp3 as an option for sale here in Australia. For Australia, it will be the lonesome Yourban 300. A shorter more compact 3-wheeler that's due shortly. Though I digress. The point of this short article was the upgrade of the Mp3 LT range as sold in Europe. Colour upgrades are the norm and trim finishes are something we would expect to happen naturally. What did raise my interest was the inclusion of Piaggio's PMP Multimedia Platform, daytime run lights and a USB charging station. We see Piaggio's X10 500 maxi-scooter later in the year. The X10 will be the first time we in Australia will see the new multimedia platform on a Piaqgio model here. The PMP Multimedia Platform is an app that can be downloaded on your smartphone. 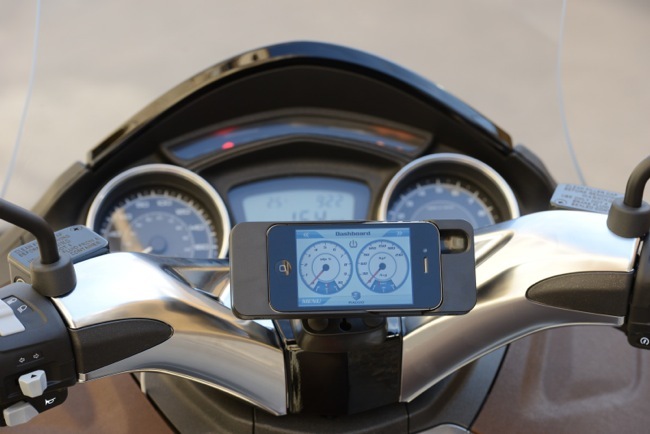 After it's all hooked up it can provide information such as speed and revs. Other information includes instantaneous engine power and torque, longitudinal acceleration, instantaneous and average fuel consumption, average speed, battery voltage and much more. It's also a diagnostic tool. 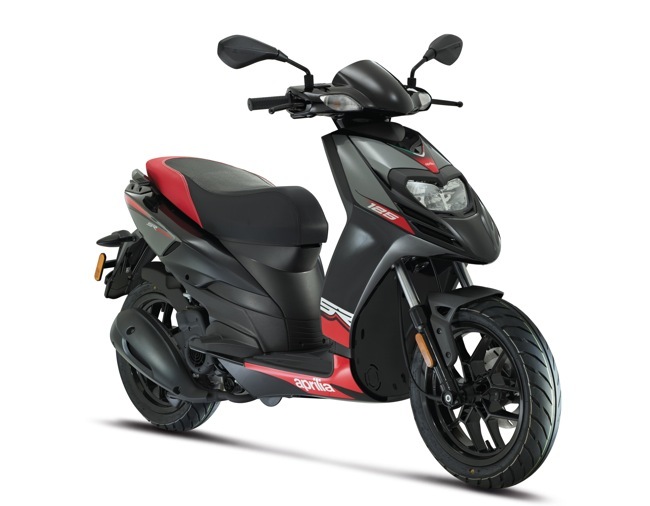 I'm betting Piaggio will continue to roll the PMP Multimedia Platform out across other premium models in the Piaggio range. I'm also guessing the app will be able to do a host of other duties as time goes on. Definitely one for the tech lovers. It's that time of the year. Take advantage of the end of financial year savings at Sydney's Scooter Central. 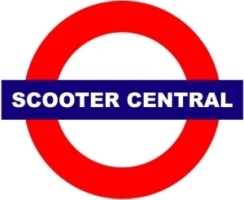 Scooter Central on Sydney's Northern Beaches is having its End Of Financial Year Sale (EOFYS) until June 30, 2013. They have gone completely crazy and marked down the price of every single scooter on the sales floor (Over 40). Central have also decided to slash 20% off everything on the shelves. Yes everything, including over 200 helmets, 250 sets of gloves, 36 colours or styles of jackets and an extensive range of Kevlar fashion jeans. Honda Motorcycles Australia is pleased to announce Toowoomba Honda Motorcycles has been awarded National Dealer of the Year 2012. 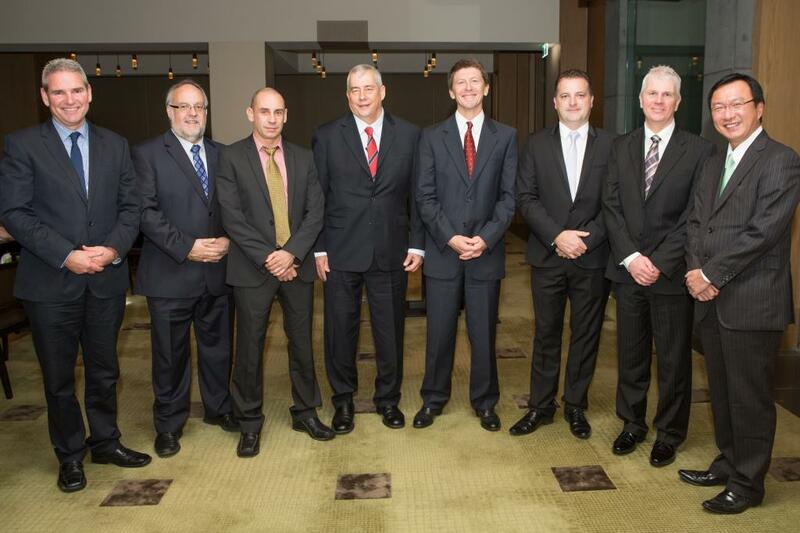 The announcement was made at the Dealer of the Year Awards Dinner held in Melbourne over the weekend. Honda took the opportunity to congratulate all of the State and Territory winners who were all in attendance at the awards dinner. The Honda Motorcycles Dealer of the Year Awards reward excellence in dealership management and customer service. Over a 12 month period, a rigorous performance review is undertaken on all Honda Motorcycle Dealerships in order to calculate the winners. Toowoomba Honda Motorcycles achieved the highest score through a strong Customer Service Index (CSI) rating and strong sales growth throughout 2012. Servicing a large provincial centre, Toowoomba Honda Motorcycles offer both road and off-road Honda Motorcycles along with ATVs and agricultural product. Honda appreciates the vital role Honda Dealerships play in responding to customer’s needs and expectations and would like to thank the entire dealer network for their hard work and to congratulate all of the winners. IMAGE: (L-R) Martin Guppy, Moto Adelaide, Robert Toscano, Director Honda MPE, Justin Nobes, West Coast Honda, Steve Andrews, Toowoomba Honda, Steve Armitage, Cyclone Motorcycles, Jason Newton, Freestyle Honda, Farrel White, Horizon Motorcycles, Hiroaki Funami, Managing Director Honda MPE. Absent: Shane Turl, Hawkesbury Honda. The new matt black GTS 300 SuperSport due into dealers this month. 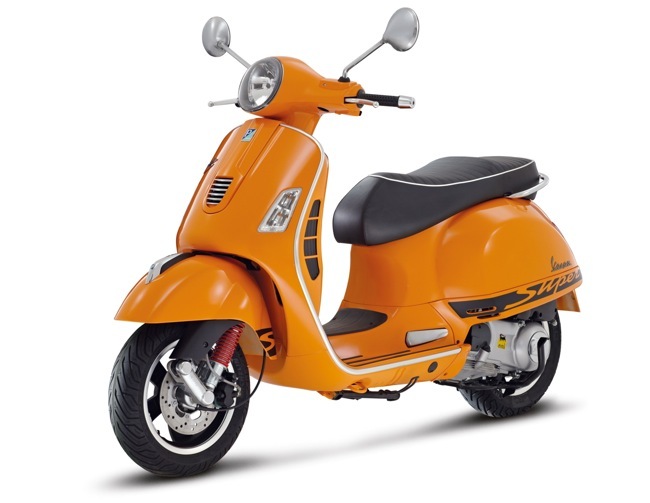 A new colour for the Vespa GTS 300 SS will be released this month into the Australian dealer network. 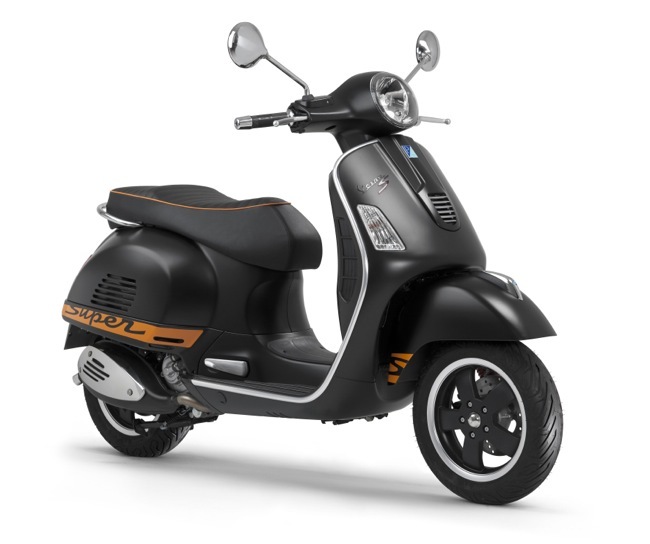 The Vespa GTS 300 SS will now be available in a matt black with orange graphics colour scheme. This is the reverse of what we have on dealers floors currently which is orange with black graphics. Each year the sport is updated with a slight variance on colours. We've seen matt black before, the orange lettering being this years differentiation. Unique features on the Sport include a red front spring, black dash background and in this case, orange piping on the seat. The Vespa Special Sport Series embodies the values of style, convenience, safety and sportiness of the most famous and widespread scooter in the world, assembling the heritage of legendary models such as the Vespa GS 150 of 1955, the Vespa 180 SS of 1965 up to the T5 “Pole Position” of 1985. From its introduction, Vespa has been diversified into sport versions, often used for track speed competitions, sometimes even in the most important offroad racing competitions. The Vespa GTS Super Sport version brings back, in a modern key, the extraordinary tradition in the competition world which characterised unforgettable years of Vespa history. Vespa GTS SuperSport combines not only sportiness and performance, but also distinctiveness and character: thanks to its design and its technical contents, it re-interprets a "sporting classic", in the extensive Vespa collection. 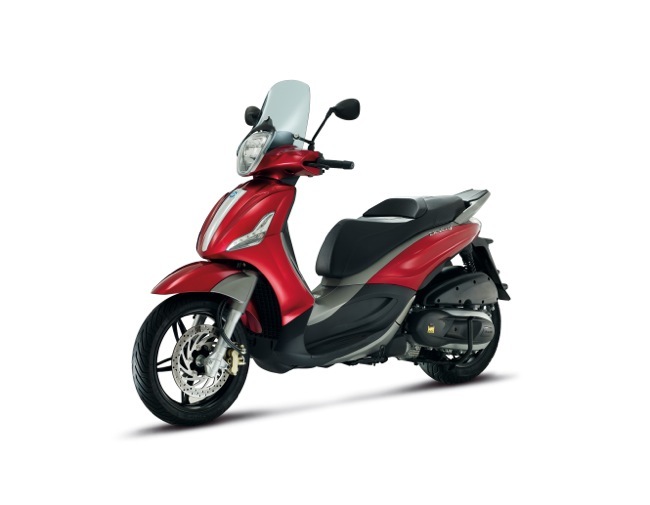 The body, Vespa's metallic essence, is distinguished by a score of personality. The right hand side now sports a distinctive grille with horizontal slots – a clear reference to the most stylish Vespas of the past – which gives a marked sporty touch to the side view of the vehicle. 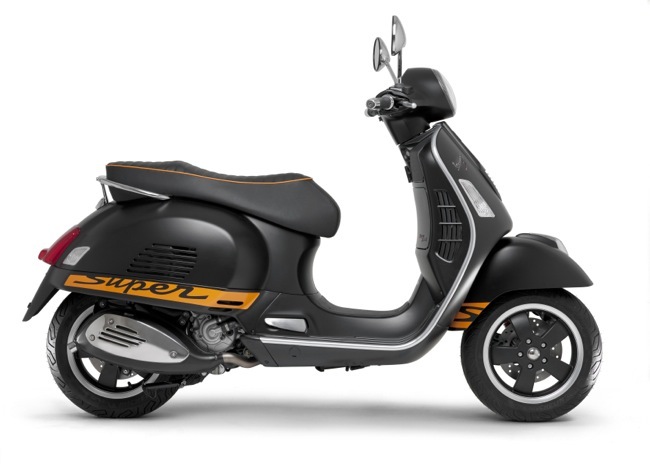 The steel body on the Vespa GTS SuperSport is painted in an original and spirited titanium grey colour scheme which enhances its design and solidity. The 300 electronic injection engine brings out maximum aggressiveness, whether in the city or on country roads. The dedicated graphics, the sport saddle with orange piping and heat welding complete the sport aesthetics of the Vespa GTS SuperSport. The suspension system is enhanced by a racing red varnished spring on the front, a "racing" detail that distinguishes the sporting look of the GTS 300 SuperSport. The aggressive front leg shield also underscores the model's sports character, with a stylish grille with chrome accents replacing the daylight running light. The two-colour alloy wheel rims recall the dismountable ones of the past. The all-analogue instrumentation, in keeping with the finest motorsports traditions, is modern and functional with white numerals against a black background, and is as easy to read as it is distinctive. Hurricanes Express chooses Aprilia to deliver burgers and ribs around Sydney's Eastern suburbs. The guys at Hurricanes were after a delivery option for the new Hurricanes Express store on Bondi Beach. These guys do succulent take away burgers and steaks over the counter. They even have the option of delivering these delights to your door. Looking for a delivery option was simple. 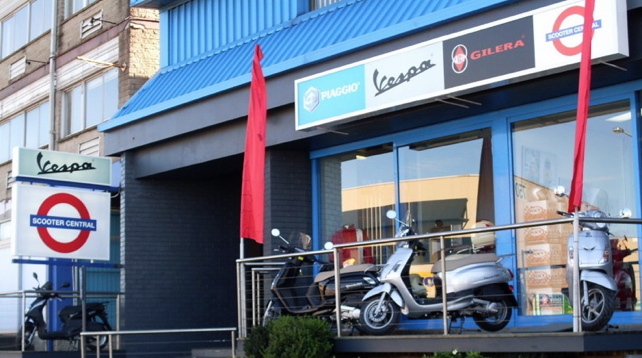 Racecourse Motors in Randwick simply supplied two Aprilia SR MT 125 scooters. Allan at Racecourse Motors also recommended fitting each scooter with a 55 Litre Givi box. These boxes will easily cater for the biggest burger and rib deliveries. 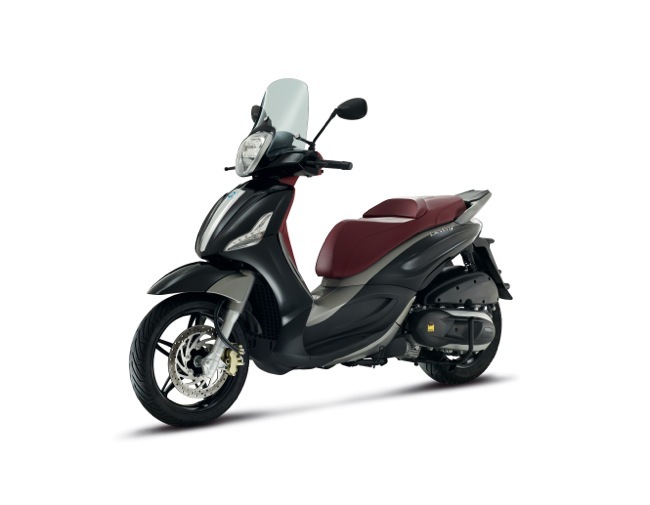 The SR MT 125 has adapted to the delivery role with ease. Big wheels help negotiate obstacles like gutters and the numerous road humps. The engine provides enough oomph to get up some of those hills around the Bondi area. Both scooters have also been given the Hurricane sticker treatment. So if you live around Bondi or the Eastern Suburbs look out the for a good looking pair of Hurricanes delivery scooters. Two very distinctive Aprilia SR MT 125 scooters. 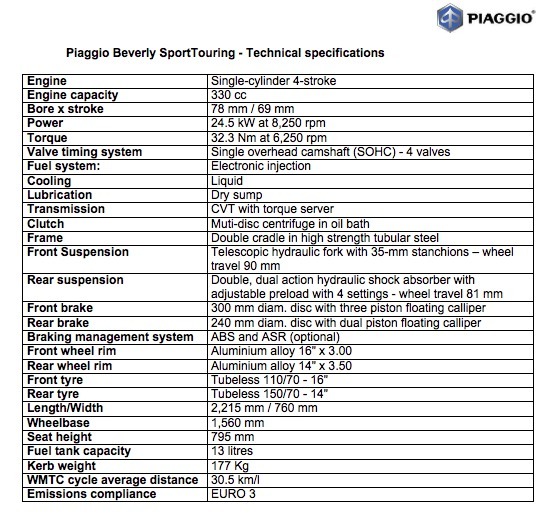 The Piaggio BV 350 SportTouring is now available at your local Piaggio dealer. 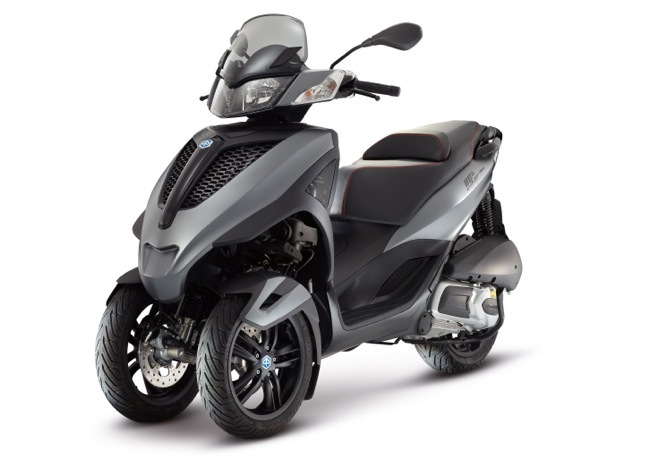 Today, Piaggio Australia are releasing the BV 350 SportTouring into the Australian dealer network. 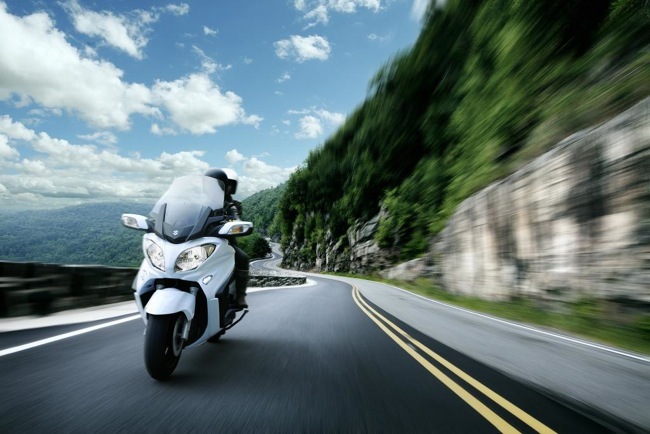 The BV is Piaggio's middleweight sports tourer that features a host of advancements that we are seeing here for the very fist time. The heart of the BV 350 is the new dry sump 330 cc engine that provides 400 cc levels of power in a compact lightweight format. A new wet clutch arrangement helps extend service life and improves overall performance. The availability of both traction control and ABS combined in the one package, again this is a first for this category. Other key features include a large 13 litre fuel tank, massive underseat storage and security immobiliser. Service intervals are set at 20,000 km's with an oil change "only" at every 10,000 km's. Built in Europe, the BV 350 combines the elements of sports, touring and commuting. Warranty for the BV 350 is set at 2 years and the list price has been set at $7290 plus on-roads. Available in the colours of Black, Blue and Red. The BV 350 is the first of three new scooters to be launched by Piaggio Australia this year. The Yourban 300 and X10 500 will arrive into Australia shortly. 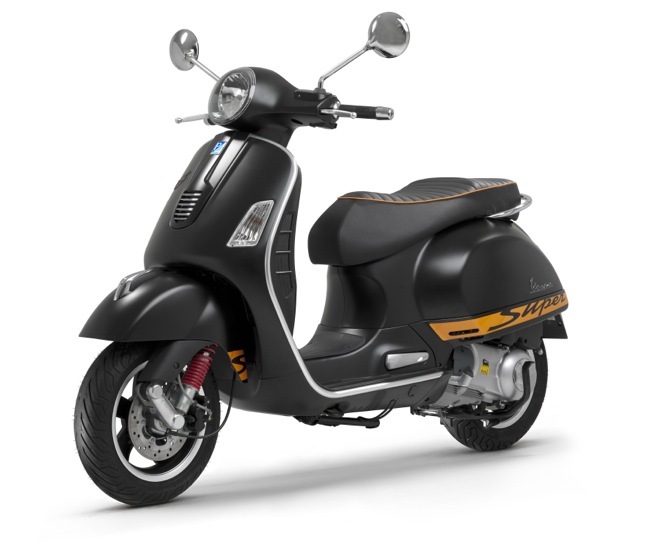 Find a Scootersales Piaggio dealer. We've been inundated by maxi scooters. This June we get our hands on 3 of the best maxi scooters currently available. It's not often you get to lay your hands on the best maxi scooters on the market, all one after the other, all in the same month. Firstly we've been getting reacquainted with BMW's scooter duo. The BMW C600 Sport and the C650 GT were first released late in 2012, I remember the launch fondly. We've now had the pleasure of being able to spend some extended one on one time. We'll have a full report shortly. 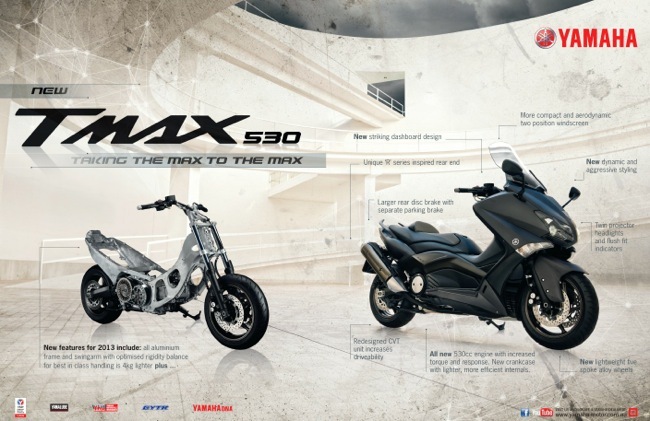 Next week the new TMAX 530 enters the Scootersales garage. This will be our first chance to extensively test Yamaha's updated offering. The TMAX 530 has been given a host of refinements, said to now be lighter with a little more power across the entire range. A new rear aluminium swingarm, new styling features everywhere, the TMAX 530 should be a good thing. Again, we'll have a full report shortly. Winter is here, so it's a perfect time to be riding the best maxi scooters on the market today. 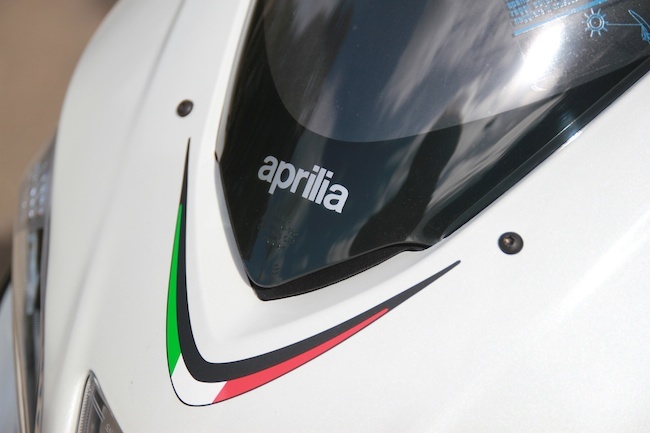 This July will see Aprilia's SRV 850 added into the equation, so watch out for that one. 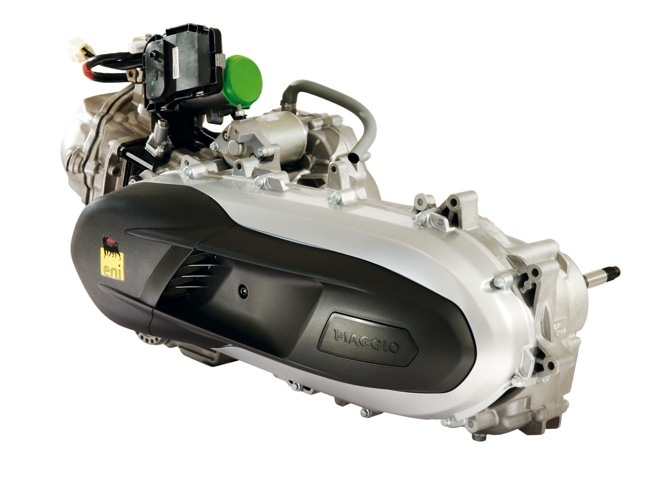 At the end of the year Piaggio will join the maxi ranks by adding the new single cylinder X10 500. 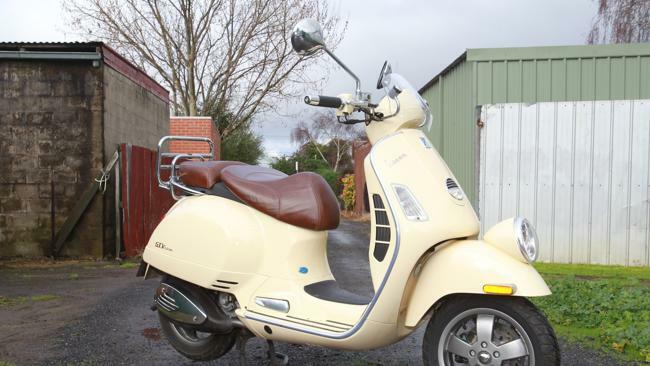 The Australian market will once again be spoilt for choice in the maxi scooter segment. 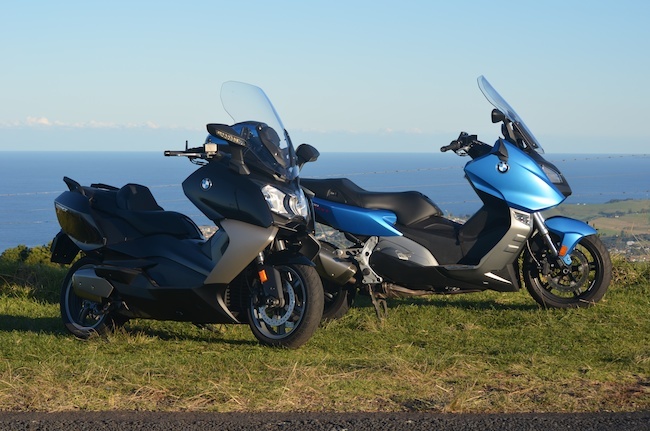 In June, full reviews on : BMW C600 Sport : BMW C650 GT : Yamaha TMAX 530. Coming Soon, Aprilia's SRV 850 ABS/ATC.